Treat guests to a sparkling surprise - our recipe for Bellini with creamy white & marinated peaches pairs a homemade cocktail with a side of soft white cheese and fresh fruit. Finding complementing contrasts in the smooth character of the cheese, a puree of sweet peaches add colour and zest to a dash of sparkling prosecco. 1. To make the bellini, pour the peach puree into two champagne glasses and carefully top with Prosecco. Drop in a couple raspberries. 2. Remove the stone and slice the peaches. Toss the peach slices with the rest of the ingredients. 3. 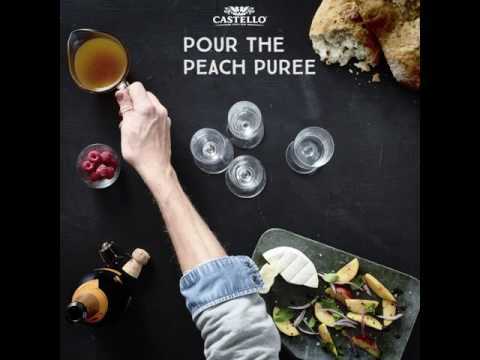 Serve The Castello Creamy White with marinated Peaches and Bellinis.